My little collection of inky backgrounds was still on my desk so before tidying them away I selected one to use for a card and would you believe I actually had to cut into a whole new sheet of toning card for the die cuts - this of course has resulted in more snippets for the oddments boxes!! I had thought that the dies would fit nicely onto a 5 x 7 card but they are just too wide so I juggled them a bit to fit my favoured 6" square card blank instead. The inky background was a bit pale in places so I added a touch of darker ink so that there was more contrast between the layers and I managed to find a fairly large scrap of a darker tone to frame everything. The flowers were cut from the left overs of the background and they have a dot of Stickles in the centres. The card looks a lot brighter on my screen but in fact it is more subtle in real life. The weather has been fine and sunny (also quite warm too) for a couple of days despite the forecast saying that we were in for rain and thunder storms all over the Bank Holiday - I hope you've all been lucky with the weather too and enjoyed the break. 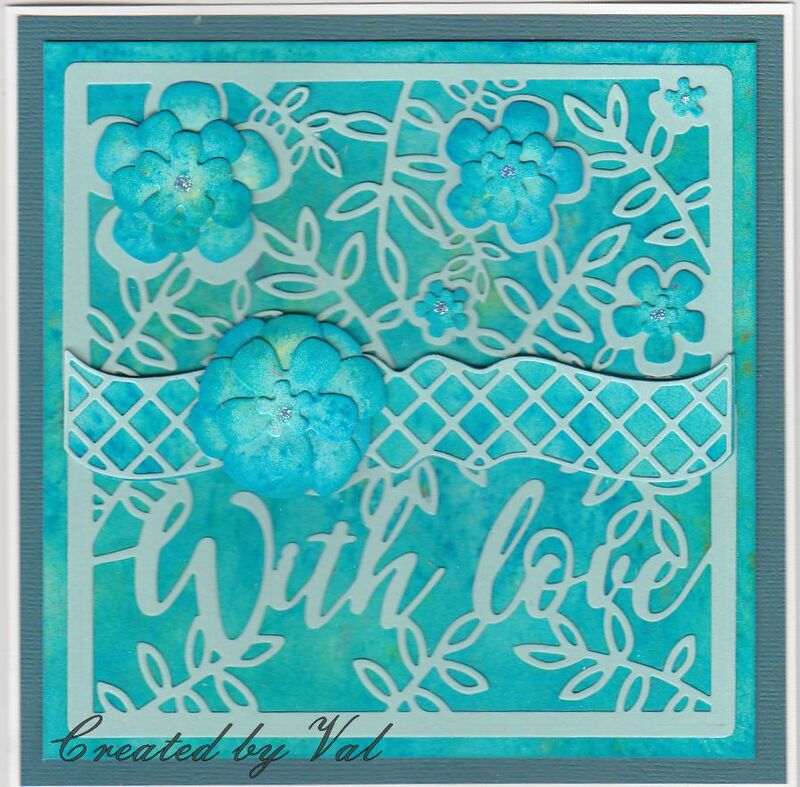 I love the gorgeous colours in this card Val and the wonderful matching flowers too. Thanks for the info Val and pointing me in the right direction. All fixed now. 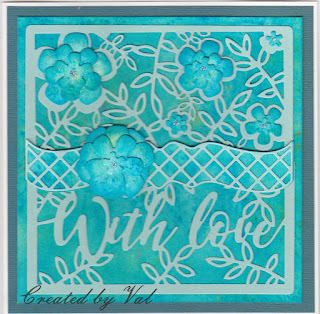 Love the vibrant blue on this card. It is my firm belief that snippets are a mutation of a rabbit and we all know what they do. Hugs Mrs A.